No, that’s not the address to the finest club in town, it’s the latest preamp model from Meridian. 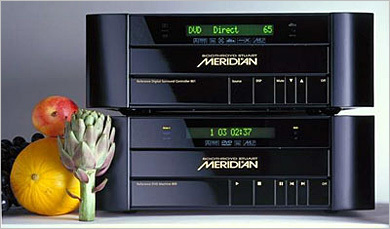 I’ve always loved Meridian’s slick and clean looking components, but have never had the pleasure of owning one. To give you an idea as to why, the Meridian 861 preamp retails for $16k and can cost up to $20k fully loaded (fruit not included). So, if you love to dream or you can actually afford one of the finest audio-video components in the world, then point your browser over to Revolution Home Theater where they have a full review. After reading the review, I’ve decided to start a Meridian 861 fund. I’ve got $5.00 allocated already… wish me luck.